Here I am today, sitting down, putting pen down on paper whilst gathering my thoughts on the amazing Energy Enhancement Course that I am currently on. Where do I begin? Firstly, I felt it would be great to share my experiences of the Energy Enhancement course with other like-minded people. The following information is for those interested in growing spiritually, and wanting this world to become a better place - starting from improving themselves! My name is Honey Kalaria ( www.honeykalaria.com ). I live in London, UK and am a dancer, choreographer and an actress specializing in the world of Bollywood (the Indian Film Industry). I run Honeys Dance Academy, the largest British Asian Dance academy in the UK, running 14 schools throughout London and teaching bollywood dance, bhangra and acting ( www.honeysdanceacademy.com ). I also run Diva Entertainments, which is an agency specialising in providing Asian artists for television, films and stage shows ( www.divaentertainments.com ). Although involved in the world of glitz and glamour, I have always been interested in Yoga, meditation and growing spiritually. I respect all religions and faiths, as I believe they can all be used as a ladder to climb up to God. Personally, although I am from a Hindu background, I am a firm follower of the Religion of Humanity. For me, this means trying to make a difference to the people around you every single day, trying to follow a righteous path every single day and making a difference to the world every single day. This I believe should be done through your work, actions, words and deeds, instead of following rituals and customs, although rituals do help people focus on the religious work at hand. My interest in spirituality has been there since childhood. My Mother used to advise me on how I should pray every night before going to sleep so God could look after me. So, from the age of 2-3 years, I have prayed almost every night, except when I went through a period of becoming an atheist. Yes, an atheist! My knowledge of spirituality came from a lot of different sources – from a young age I used to get involved in a lot of Hindu ceremonies, around the age of 13years I attended Bible study classes and by the age of 18, I had attended numerous seminars, workshops and courses on meditation and had read many books on related subjects. In my late teens I lost my sister in a tragic car accident. I was shocked and felt abandoned by God due to what had happened, and it was then that I became an atheist for a number of years. Luckily, with passing of time I healed and became strong again. I couldn't keep away from my thirst for spiritual knowledge, and so after a few years, I began learning about different faiths again. I studied about Buddhism, Hinduism, Islam and Christianity and read extensively about Mysticism and Eastern Philosophy. It seemed like God kept testing me along my path through different experiences, and teaching me lessons to help me acquire more wisdom and understanding, but never allowing me to lose complete faith. In the year 2000 I was blessed to meet my Guru - My spiritual growth accelerated in the next few years with Guruji's blessings, and to help me grow further, I feel he guided me to enrol on the Energy Enhancement Course. I felt strangely drawn towards the Energy Enhancement Course when I stumbled upon it through my internet research, a week or two after I had returned from “Guru Purnima”, a special spiritual event that I celebrated in India in July 2004. Since then I have started up a meditation centre where meditation is taught for free within easy traveling distance of London. A t the East London Meditation centre, I thought I would inform everyone of this opportunity. There seemed to be a lot of personal commitments coming in the way and resistance to the Energy Enhancement Course by everyone except one friend and my father who agreed to join me. So without wasting much time, the course was booked for the three of us. The course was run by Satchiji, a modern day Guru, and assisted by Devi, a chakra clearing sacred dance expert and Reiki Master. Once on the course, my exciting adventurous journey began! In my life I have done hundreds of courses but the Energy Enhancement Course I found to be completely different. Firstly, the contents and the teachings seem to be inspired by higher forces and had a deep base in spirituality. Also, you don't just learn about ideas, concepts and theory, but also learn through direct experiences whilst doing the exercises. As you progress through the course, the powerful and effective techniques are taught step by step, so that at each initiation you can work thoroughly and obtain a firm understanding. The Energy Enhancement Course involved learning how to connect with the Universal Energy , some would call it the Life Force, Spiritual Energy or God , and being able to tap into this powerful energy. By having a direct connection with the Infinite Energy you begin clearing and activating your chakras or the seven power centres in your body and those chakras above the physical ones , and start removing blockages from your physical and your psychic bodies (aura). These blockages normally prevent people from growing spiritually and living a more harmonious and peaceful life. The Energy Enhancement Course has helped me to strengthen physically, emotionally, mentally and spiritually whilst building my psychic muscles to encourage stronger intuitive skills to develop. I was told that each of our seven chakras within our bodies and the chakras above the crown chakra should be seen as a separate mind - brain like one of the processors in a parallel processing computer . All the Super Computers these days are parallel processing computers. The integration of all the processor chakras produces the super computer you. We use only one brain or processor and the idea is to activate the other chakra brains or processors to build your creativity, intellect, wisdom and genius abilities. This will lead you to become happier and healthier, enjoy being a more emotionally and mentally balanced person and become a more blockage free ( free of negative emotions) human being. The idea is to have a purpose in life to make this world a better, more peaceful and spiritual place, starting from working on yourself as mentioned before. The Energy Enhancement Course offers a wide range of theoretical knowledge gathered from the most powerful spiritual teachers and sources in the world. I have had the opportunity to absorb teachings from world renowned Guru's, Religions and topics such as Satchidananda, Maharishi Mahesh Yogi, Sai Baba, Gurdjieff, Bhagavad Gita, The Bible, Zen Buddhis m , Sufism, Mantras, The Yoga Sutras of Patanjali, powerful meditations, Free Reiki Mastery and much, much more. I also learnt techniques that include visualization, psychology and powerful spiritual practices together with studying films with spiritual messages. This combination has resulted in giving each student on the course, including myself, a “fast track” spiritual growth boost by expanding our awareness levels and sharpening our intuitive powers. I must admit that when I started I wasn't exactly sure where all the exercises were going to be leading to, but then I began to have profound experiences. There are just too many to share and perhaps one day I may even write a book on the amazing journey that I have been through whilst on the Energy Enhancement Course. My experiences include having visions, being healed physically, receiving excellent guidance and deep insights from the Spirit of God, finding hidden inner children, sub-personalities and strategies that I use to behave in a certain way and justify my actions and then finding my 400 year old husband!! The list just goes on. One of the experiences I would like to share with those who believe in re-incarnation is that in one of the exercises, I was blessed to see some of my past lives. I was astounded by what I saw, the clarity of the visions and with actual dates being revealed. What I learnt was that we came into this life to learn various lessons or to complete certain outstanding desires. It is so important to be careful with what you wish for in this life. 1308 – I was a high society male teacher / lecturer who gave talks about my research into stars, astrology and philosophy. I taught large groups of people, was involved in discussion and debate groups and was well respected in the area of my work. I was also a womaniser and drunkard and died at a young age in my mid 30's. I tried to get my name and got the name Martin or Matthew and second name was something like Hayward or Haywood. CURRENT PERSONALITY TRAITS : I am a strong communicator, enjoy teaching as I am presently a dance teacher, give lectures in business and success, interested in Astrology and philosophy, a non alcoholic and am a leader in my field of work. 1412 – In my next life I was again living in high society – it must have become a habit to be born into such an environment. I used to be a right hand assistant to the Princess of Jaipur and was accustomed to living in luxury in a grand palace. The princess and I used to take dance classes with a dance Guru and then we would both have fun and practice together. My Father was a farmer providing food and fruits to the King. I got used to organising all the important things for the princess. I even regularly prayed and danced in the Temple for Religious celebrations with the women. There was an incident where a Prince had come to ask for the hand in marriage of the Princess but ended up falling in love with me. From that a lot of challenges and problems were created for everyone concerned. CURRENT PERSONALITY TRAITS: I have developed skills to delegate and organise projects, run my entertainment business empire successfully, enjoy wearing beautiful Indian costumes and garments, always thought I deserve to be treated as a Princess, perform dance professionally, appreciate historical buildings and palaces. 1638 – It seems that I had taken away someone else's potential marriage partner, so in my next life a partner was not written in my destiny. I was a popular happy go lucky Norwegian girl born in a poor family. I saw my house based on top of a hill with countryside to be seen all around, the market place where I would go to buy vegetables and many other details. My mother had passed away and so being the only child, I used to look after my old and weak father. I always felt that to be a good daughter I had to support my family, otherwise I felt guilty for not being there for them. As a result, I never married my lover and suppressed all my wants and desires. I lived the rest of my life as a spinster. CURRENT PERSONALITY TRAITS: Find it difficult to break away from my family, and am presently quite happy to be single and living with them. I am also attracted to European men, enjoy the countryside, love nature and get great pleasure in spending time at home (whenever time permits from my busy schedule). I am comfortable living in extravagance as I did in the Jaipur Palace and yet I can be equally satisfied living in simple accommodation as I did here. 1705 – Perhaps I was so heart broken that I must have been wishing to experience what it would have been like being married or having men in my life. So in my next life, I was born as an Arabian dancer, dancing for the rich Sheikh in the desert. I used to look after and be of service to the male guests of the King, and possess excellent communication skills and etiquette. I was born to a beautiful single Mother and was trained to dance at a very young age. After I reached a particular age, I was sold/given away. Luckily I had a lot of faith in God to make things better and constantly prayed to give me strength and take me away from the lifestyle that I was in. CURRENT PERSONALITY TRAITS: Learnt that it is important to establish a long term personal relationship packed full of variety and consider one night stands as complete waste of time, blessed with natural dancing talent from birth (the skills have developed over many lifetimes), I adore Arabic music and consider belly dancing to be one of my favourite dance forms, I am very spiritual, I enjoy water around me (probably because it was rare to see water in the desert) and have an aquarium in my home and a pond with a waterfall in my garden. I also tend to get along very well with male friends and business associates. CURRENT PERSONALITY TRAITS: I am always asking questions - as I'm sure all my present Gurus and teachers would agree! I'm extremely interested in spirituality and feel drawn to that area. I have now chosen to wait for a lifetime partner to enjoy a sacred physical relationship with and I felt an urge to study Buddhism. Satchiji suggested I go through an Energy Enhancement past life regression exercise to find out if I previously knew one of the students on the Energy Enhancement course called Ramya. 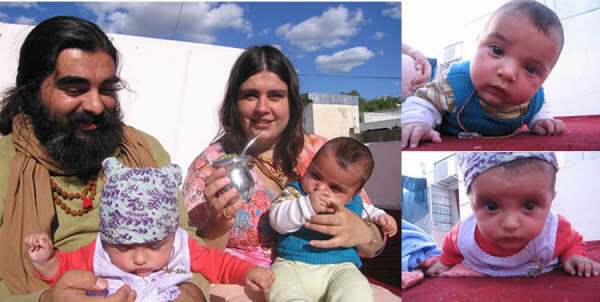 Ramya is half Italian and half Spanish, a Hare Rama Hare Krishna devotee and is a Radio presenter for a spiritual program that was voted the best Radio Program in Argentina and received The Golden Seagull award. I was feeling his magnetic energy from the start of the course and became curious as to why – I have never felt this type of intense connection! I felt that I knew him and Ramya also felt that we had met before and had a very strong connection of some sort. 1611 During the exercise I found myself on a battlefield / town in Turkey. I was crying and leaning over Ramya's body that was covered in blood as he lay dying in front of me! Scenes of death and destruction were all around me. I had a young child in my left arm and I was pregnant. I was so much in love with my husband and felt heart broken seeing him suffer during his last moments of life. I must have made a vow to meet again in our next life so we can be together once more. I noticed how throughout my lives I had never got married and even today I remain single as I am so dedicated to my work. Ramya and I had to both ground this karmic relationship using Energy Enhancement techniques so that we could now be free to move on. From the Energy Enhancement Course I have just realised that my past lives have also enabled me to develop an interest in different religions and faiths. From my life in Jaipur, I followed Hinduism; as a British lecturer or Norwegian, perhaps Christianity; from the life as an Arabic dancer Islam/Sufism and from a Buddhist monk, Buddhism and meditation. I understood how lifetime lessons and experiences actually develop your soul and past life impressions remain on your psychic bodies. Once certain negative karmas are found, they need to be grounded so that they do not affect your current life situations. I found this insight to be such an eye opener, especially when meeting my 400 year old past life husband from Turkey! 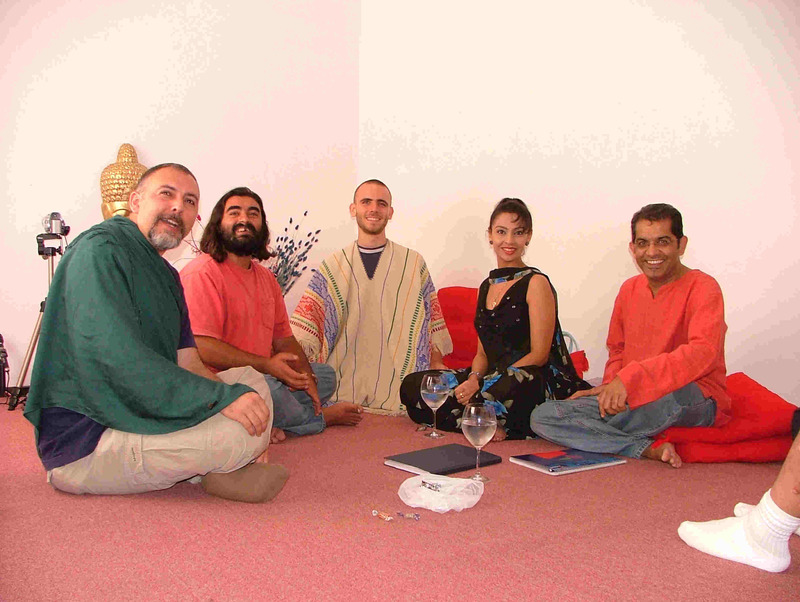 I couldn't believe that from all the places in the world that I can travel to, I ended up being drawn to Argentina, doing a meditation course, meeting Ramya and completing a Karmic relationship promise that I had made 400 years ago. 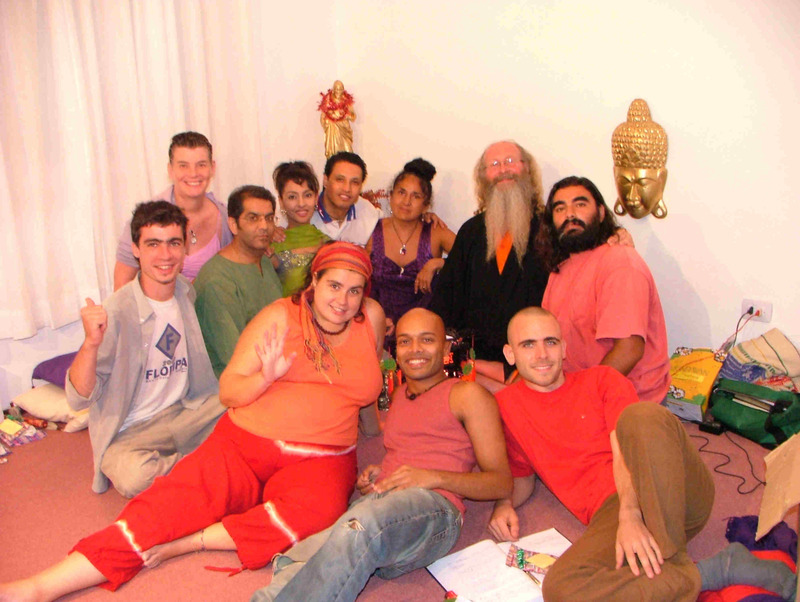 DEVI, VANESSA, DHIREN, RAMIA, HONEY, FEDERICO, SIVANANDA, DAVID, SHAKTIANANDA, SANTHAN, NATWARLAL, HONEY, DEVI AND SATCHI, ABOVE. These people came from all faiths – Sai Baba followers, Catholics, Buddhists, Krishna devotees etc. Shaktiananda gave birth to two babies 2 months after the course! It was fantastic to see insights into the world of spirituality and how the Energy Enhancement techniques were creating profound changes in people's lives. Deep rooted issues would surface and as soon as they were dealt with, even deeper issues would emerge that we would have to deal with. It was like peeling layers of an onion to go deeper and deeper into our core being to understand who we are and what kind of personality traits we have adopted, consciously and sub-consciously to deal with the issues of this world. I understood clearly how these beliefs, conditioning and past life impressions were affecting all areas of our life. In addition, I also learned how to use the Energy Enhancement techniques to help me ground these negative blockages so they would never affect me again. Of course complete freedom can only come after a maintenance program has been followed. I continue to say Thank You to God for blessing me to be on this course. I think you need to be extremely lucky to be able to receive such spiritual knowledge and teachings. When trying to do God's work, you always attract dark forces to keep you away from growing spiritually, and there were many challenges experienced by my fellow students and I trying to prevent us from growing. These would be in the form of negative thoughts, distractions, feeling lazy and sleepy, right though to people having to leave half way through the course. Satchiji and Devi had already warned us in the beginning that if you are not vigilant then some of you will not be able to complete the course, and I had a direct experience of that. 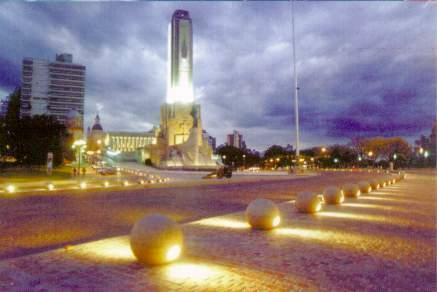 My father was one of the people enrolled on the 1 month course in Argentina who had to leave half way due to the death of my uncle (his older brother). He had to immediately fly back to London after hearing the sad news. One other Buddhist student on the course left suddenly, perhaps because Satchiji had said that he may have been a Black Magician in one of his past lives. None of us are sure why he left but he just called Devi and said that he had decided to leave. It could have been the ego coming in the way and stopping him progressing. The unusual thing was that whilst a group of us were talking and laughing, a statue of Buddha sitting on a corner table, got hit by accident. We couldn't understand how the head of the Buddha got cut across the neck in a straight line and fell on the floor whilst the body of the Buddha remained on the table without moving an inch. Later we were informed by Satchiji and Devi that this was a sign from the dark forces implying: “We have won and have taken the Buddhist student away”. As I take in depth notes, a local student who works as a radio presenter , Ramia, I talk about him more later, requested if I could go through all the notes and exercises with him. Twice we arranged to meet but each time he failed to turn up. The first time he lost his keys and couldn't get out of his house. The second time he said that he had simply forgot. Again and again I saw these powerful blockages, distractions and situations occurring preventing people from progressing on the course. It's astounding to see how the Energy Enhancement web site currently gets over 150,000 hits per year and from those only a dozen of us were able to make it to the course, and even from these, the two previously mentioned students were unable to complete the course. Energy Enhancement Course has been described as the “most advanced meditation course in the world” and I totally agree. It is thorough, the techniques are effective, the knowledge hugely expands your awareness levels, your intuition and perceptive powers increase tremendously, you feel greatly energized with the meditative practices and the course has brought profound changes in my behaviour and in the way I see things. There are many souls on this earth (whatever faith or belief systems they come from) who could hugely benefit from this unique course. The powerful energy that they receive can be used to help themselves and mankind, making this world a better place. The energy allows you to heal yourself and others, enables you to master relationships, removes bad luck and obstacles from your life, assists you to become a more soul infused personality, works towards removing the Ego, your meditation will become deeper and your concentration levels will increase (great for exams or bringing out the genius in you) ensuring that all areas of your life gets touched by the spirit of God. As Satchiji says "Energy Enhancement, The Core Energy Techniques, is the Most Advanced Meditation Course in the World which will accelerate any other course or Technique you care to use," and “anything you do to benefit others will automatically get support from spiritual energy, allowing your work to become more successful” . As I realized how wonderful and life transforming this course is, I got inspired to make this course available to others in London. There will be a small group of people who will be able to take advantage of this “revolutionary meditative program” in London and be honoured to learn personally from the Great M aster , Satchidanand . Trust me, the course is priceless and even paying £10,000 each would have been a bargain! Why should you not give yourself the opportunity to do a fast track program that will allow you to achieve the same results in a year, that would have taken you over 20 years to obtain with any other course.